Spend half your life doing any one thing, and at some point, you’re bound to question whether or not that one thing was the right thing. 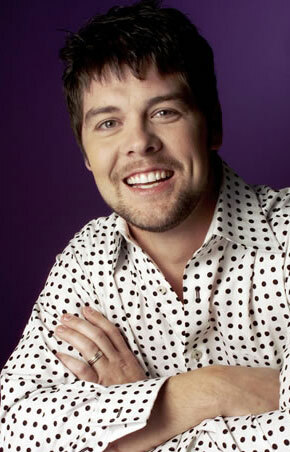 For Jason Crabb, longtime powerhouse lead vocalist for The Crabb Family, that has never been a question. With a soulful, unforgettable voice like his, the ‘right thing’ was always a given. He was born to sing. Baptized in a God-given talent pool, weaned on the hymnal and mentored by Bill Gaither himself, Jason Crabb hit the road at age 14 and, alongside his family, has pursued his calling full-throttle ever since. He’s performed at Carnegie Hall, become a ‘fan favorite’ at the Grand Ole Opry, appeared regularly on the Gaither Homecoming Series videos, and was honored to sing for the Rev. Billy Graham’s farewell crusade in New York City. His voice has echoed in churches great and small at home in the U.S. and around the world. But in 2007, the Grammy nominated, 10-time Dove Award winner, felt the winds of change blow in, and he knew it was time to pursue a new path. Solo. The eclectic, even stunning result is his self-titled debut album released in 2009. It is a 12-track collection of authentic, lyrically rich songs delivered by one of the finest voices of his generation. Certainly one of the most acclaimed voices in all of Gospel music. Produced by Grammy Award-winning Tommy Sims (Michael W. Smith, Bruce Springsteen, Michael McDonald, Amy Grant) and Norro Wilson (Kenny Chesney, Reba McEntire, George Jones, Shania Twain), Jason Crabb showcases this one-of-a-kind vocalist in all his stylistic glory. From driving full-country tunes to R&B-infused gospel to reinterpreted southern gospel classics, the recording features cameo appearances by country music legend Vince Gill, Southern Gospel mainstay The Gaither Vocal Band and acclaimed songstress Sonya Isaacs. Continuing the tradition his father, Gerald Crabb, taught him so well — that the best lyrics are rooted in real life, where real people live — Jason’s solo debut paints with broad strokes: Authenticity. Hope. Faith. Humanness. It was never a question in his mind. Jason Crabb was born to sing. And sing he would. Anyone who has ever heard him sing would bear witness. His gospel roots always ran deep, and he logged the miles to prove it. But this, this is different. This is Jason Crabb, standing in his own shoes, singing the songs that make his own heart, his own voice, soar.